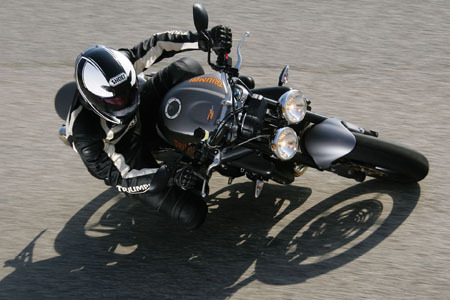 Following on from the phenomenally successful Triumph Street Triple, Triumph is introducing a new, higher-specification version for 2009 – the Street Triple R.
With the Street Triple already regarded as the class-leading middleweight streetfighter, the ‘R’ version takes the standard bike and adds race track technology. Fully-adjustable 41mm upside down forks and a top-spec rear monoshock unit with piggy back reservoir deliver sublime handling, while radiallymounted four piston calipers grab the twin 308mm brake discs and ensure the Street Triple R stops as well as it goes. streetfighter. The sporty feel is completed with wide, tapered aluminium handlebars from Magura and a 5mm taller seat height that puts the Street Triple R rider in the perfect position to attack the twisty stuff or cut its way through the urban jungle. 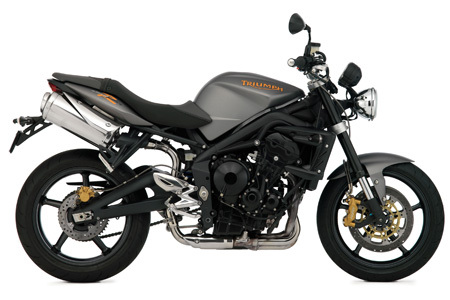 Completing the Street Triple R’s distinctive look are two all-new exclusive colour schemes: Matt Graphite with orange graphics and Matt Blazing Orange with grey graphics (the latter will be available from January 2009). Both colour options are further enhanced by black anodised forks and a two-tone black and graphite seat. The new Street Triple R will be available in September and priced at £6,099.